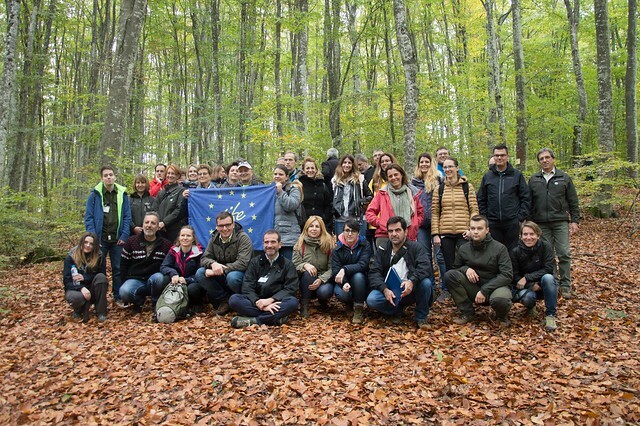 This blog post is a part of a series of blogs on the participation of foresters from the Slovenia Forest Service in the LIFEGENMON and GenTree project joint stakeholders event on forest genetic monitoring, which took place from 23 rd to 25th of October 2017 in Thessaloniki, Greece. For more context, please read part 1: From Ljubljana to Mount Olympus and part 2: What does forestry practice need from forest genetic researchers? On Wednesday morning, we boarded a bus and set off to Arnaia (Chalkidiki area). There lies the second LIFEGENMON forest genetic monitoring plot in Greece, where experimental forest genetic monitoring field measurements are taking place for European beech (Fagus sylvatica). It’s notable that this monitoring plot is also used in the GenTree project. Greek researchers and foresters presented the plot and the surrounding forests, and then a discussion about differences and similarities between both projects and a number of other topics took place. Group photo at the Greek LIFEGENMON forest genetic monitoring plot. In the short-term, the foresters do not expect forest genetic diversity to be severely threatened. They believe that the implementation of forest genetic monitoring is not urgent, but it would be welcome and useful due to the increasing rate of environmental changes and their effects in forests. In the future, forest genetic monitoring should become a part of close to nature management. More communication, outreach, education and extension in the wider field of forest genetics is needed. Relevant materials prepared in both projects should be prepared in a language, suited to forestry practitioners. Additional research in the wider field of forest genetics is needed and supported by both forest services, especially applicative research. Both forest services support the LIFEGENMON and GenTree projects and would like to take part in future projects concerning the practical aspects forest genetics. The Slovenia Forest Service foresters would like to thank all of the organizers, and especially the Greek foresters for making us feel welcome and an excellent organisation of the event! ← What does forestry practice need from forest genetic researchers?